The church of the SS. Crocifisso, Matrix of the Siculiana as well as diocesan Protosanctuary, was built by the Carmelitan Fathers at the end of the 16th century on a concession of land by the Baron Blasco Isfar. To the church which had already been dedicated to the Madonna del Carmelo and San Leonardo, was then annexed the college of Mary. 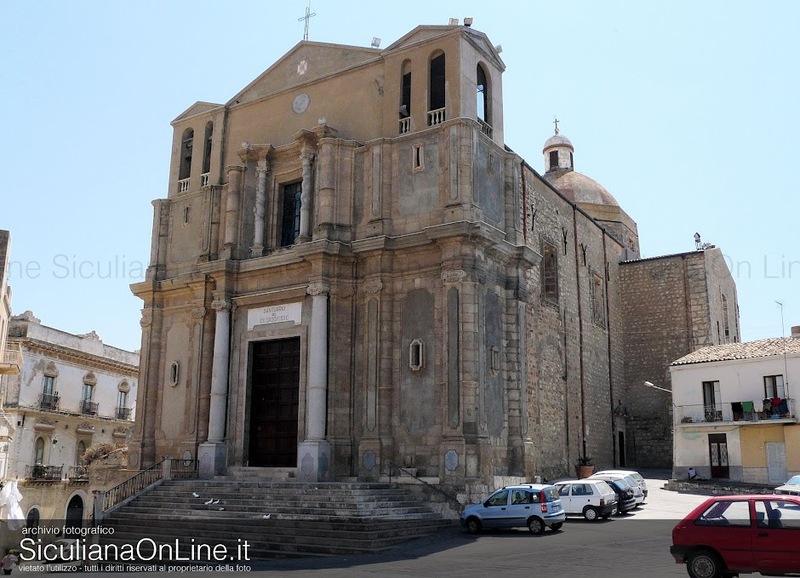 Thanks to the worthy offer made by Don Vincenzo Alfani, a noted citizen and father-in-law of Baron Stefano Agnello of Cefalù, who donated 500,000 lire and together with the offers of other faithfuls, that decoration and the work of expansion of the church, was begun. This endeavour was completed by 1813 with the realisation of the transept, the dome, the apse, the sacristy and the oratory. ù The long and arduous task for the enrichment of the church continued under Mons. Domenico Maria Lo Jacono and saw its completion under the guidance of the Archpriests Minnella and Antona. The final important work of restoration to preserve the outer and retaining walls was carried out by the last Archpriests Cuva and Argento. "In the year 1475 Samuel, son of Rabbi Yôna Sib'ôn. May you rest in paradise." This in one of the most ancient archeological evidence that testifies the presence of a Hebrew community in Sicily, which no one to date has ever found its traces. At that time Siculiana was a duty free port, therefore a refuge for people who, like the Hebrews, practices activities sometimes illicit for which were hunted by the royal authorities. Inside the Sanctuary there are great number of statues and numerous paintings both on canvass and on plaster. The Sicilian artist, Raffaello Politi, painted on the nave of the Sanctuary, emulating the Sistine Chapel of Michelangelo, the creation of Adam of Eve and the temptation of their ancestors. Other works, amongst them the Sacred Heart of Jesus who heals the born blind, must certainly belong to the same artist. ù An impressive and authentic work of art, which dominates the nave, is the organ situated in the cavity above the portal of the Church. This magnificent organ in reed, "Vincenzo Mascioni 1939", after years of silence and after a careful restoration, was once again brought to life. With regards to the exterior of the Sanctuary, the façade remains incomplete since it lacks the upper part in the same style as the lower part.